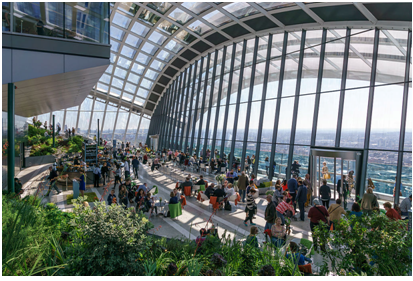 The use of large expanses of glass in architecture harmonises a structure with its environment and reduces energy costs by providing natural daylight. Companies investing in natural lighting see employee productivity jump by between 13 and 16 per cent. However, sudden variations in temperature are disruptive and the thermal comfort of staff needs to be considered for their personal well-being and therefore productivity. The type of windows used in construction can play in a role in reducing the energy load of the buildings occupants. Energy and environmental regulations and requirements have pushed the glass and metal industries to higher levels of performance. Programmes such as Energy Star have seen the labelled windows of today become twice as efficient as a typically produced window 10 years ago. Energy-efficient glass and window design maximises solar gain within the building in cold weather, reducing the need for heating. Controlling it in the summer to minimise overheating and glare. There is also the possibility of using photovoltaic glass to generate power for use in the building, further reducing energy costs. External blinds stop solar radiation before it enters the building through the glazing. Popular on the continent they are now becoming more common in the UK. Retractable blinds with an element of occupant control offers the ability to let in daylight minimising the use of artificial lighting or blocking sunlight, minimising glare and reducing overheating. External blinds can be used to minimise heat loss. When closed overnight, a layer of insulating air is trapped, reducing heat loss in cold weather. A tensile fabric ceiling or façade is a dramatic and bespoke method of shading. Offering similar benefits to external blinds and creating the potential to customise a building’s interior, buffer acoustics, soften harsh lines and hide services. Along similar lines, tensile fabric structures can be used to extend UV protection from the sun to external office areas; canopies over entrances, link walkways or free standing structures. These structures are attention-grabbing with a strong contemporary look. Usefully solutions like fabric architecture also provide protection from less pleasant weather conditions. Correct solar shading ensures the thermal and visual comfort of the building users, increasing their productivity. In addition, solar shading has the potential to reduce a buildings energy consumption offering notable financial gains. What Motivates Employees To Work For Startups?